Two low-intensity blasts outside the Chinnaswamy Stadium in Bangalore, in which at least eight people sustained injuries, delayed the start of Saturday's match between Royal Challengers Bangalore and Mumbai Indians, while another bomb was found and defused at a separate location outside the arena. The incidents cast a shadow over the tournament, whose semi-finals are to be held in Bangalore next week, and concern over security arrangements for those games. The explosions took place outside gate No. 12 of the stadium about 30 minutes before the toss was scheduled to take place. The match was due to start at 4.00 pm but the toss was pushed back until 4.45 pm and the start of the game to 5.00pm. There were around 40,000 spectators inside the venue at the time of the blasts and security measures were tightened. Initial reports indicated it was a generator blow-up, but police later clarified that was not the case. City Police Commissioner Shankar Bidari said the blasts were low-intensity and resulted in minor injuries to security staff. "The explosive material was hidden in a plastic bag and placed near the wall adjacent to Gate No 12 of the stadium," he said. 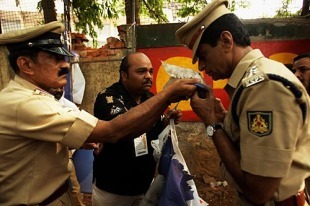 The second bomb was found and defused outside gate no 8, while the IPL match was on. The blasts did not create any panic inside the stadium; though there were no PA messages and the screens flashed a message saying only that the toss had been delayed, news of the blast was coming in from other sources yet fans kept their cool. As an immediate response, police stepped up security measures at Eden Gardens, the venue of the day's second game between Kolkata Knight Riders and Rajasthan Royals. No incidents were reported from that game. However, the Bangalore incidents will raise questions at a wider level given that the ODI World Cup will be staged in India - and Bangladesh and Sri Lanka - in less than a year from now.